Sharing top billing with such artists as Hank Crawford, Kevin Mahogany, Lou Donaldson, Jack McDuff, Herbie Hancock and Charles Earland have taken him around the world. 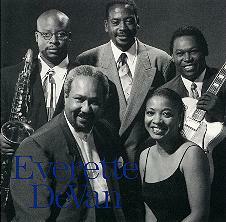 Mr. DeVan performed on the Charles Earland Jazz Cruise in 1995 and 1996. He is booked to perform on the 1997 and the 1998 cruises as well. More recently DeVan participated in a musical cultural exchange to Madagascar, Africa. This past year he has performed in Milwaukee, Louisville, and Chicago. Educated at the Conservatory of Music in Pueblo, Colorado. Everette was introduced to Jazz at a young age. He began playing Jazz Organ in local night clubs, and soon after began opening for such legends as Count Basie, Tom Jones, Emerson Lake and Palmer, B.B. King, Nancy Wilson, and The Mills Brothers. 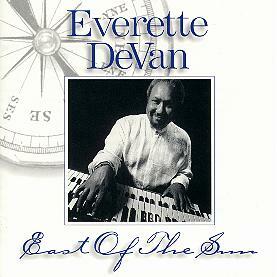 And no better evidence of this can be found than with Everette DeVan's East of the Sun. When I first began featuring Jazz organists on my weekly radio show, "The Doodlin' Lounge", I was told by many that I'd soon "run out" of organists to showcase. I knew better because with each organist that I would meet and interview, I'd hear about another and another until I realized that each city across our great nation had at least one individual keeping the Jazz organ flame burning. This has been going on unbeknownst to record companies, let alone the buying public, since the demise of the Hammond organ in 1975 and the preference being shifted to lighter, more high-tech keyboards. 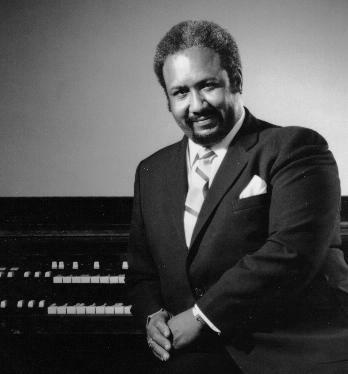 I found that some of the greatest organists still playing were those locked into positions with their church, local college or community venues. Thanks to the perseverance of Jimmy Smith and Jimmy McGriff on a national level and the spark ignited by young Joey DeFrancesco in the late eighties which brought numerous players back to the organ bench, we have once again turned our ears toward the sound of the Hammond model B-3 and its mate, the Leslie Tone Cabinet. Now we are spending the time and making the effort to listen to the talents of those who have "hung in" on the Hammond. Everette DeVan is one such individual who will no doubt benefit greatly from our renewed interest in Jazz Organ and will gain some well-deserved national attention. Kansas City knows all about Everette DeVan as he's been a staple in its music community for over 25 years. Born in Colorado in 1950, Everette attended the Conservatory of Music in Pueblo, but not before establishing a foundation in Church Organ and a deep appreciation for both classical and improvisational music. His uncle encouraged this interest in Jazz to the point where Everette was playing in local night spots even before he hit his teens. At 18, Everette moved to Kansas City where be began playing on a larger and more commercial level. He opened for acts like B.B. King; Tom Jones; Emerson Lake & Palmer; Count Basie; and Nancy Wilson. He soon organized his own trio and eventually began a group calling itself "ssSlick," which has afforded him even greater exposure. I was fortunate to meet Everette while on a Jazz cruise organized by our mutual friend, Charles Earland. I know that if Charles brought another organist aboard his own cruise, this man would have to be something special. As it turned out, Everette was sensational. ...behind bluesmen like Earland and Hank Crawford and yet showed remarkable finesse accompanying vocalists like Irene Reid or Kevin Mahogany. He provided a groove in which everyone fit into. Here's where I discovered not only the versatility of Everette DeVan but his deep musical commitment to showmanship and his crowd-pleasing manner. I feel the Hammond organ will be in "good hands" going into the next century as long as Everette is sitting at the bench! For this session, Everette has selected Kansas City's finest. Saxophonist Gerald Dunn was born in Texas but now resides in Kansas City. He began listening to Sonny Stitt and Cannonball Adderley for his early inspiration, as well as gospel players like Vernard Johnson. He brings both his tenor and alto to the recording date. Ervin Brown recently returned to Kansas City from the Los Angeles area. His early influences include Wes Montgomery and George Benson. We hear traces of both from this stylish studio guitarist. Drummer Marvin Jones has been with Everette for the last 20 years. He, too, began his musical career early and has put in time with Charles Earland, Freddy Cole and Lou Donaldson. Throughout this session, Marvin reveals his familiarity with Everette's style of playing as well as his awareness of how to stay in the pocket behind the sustaining sound and power of the Hammond organ. In the set opener "Just Crazy", Everette uses a very hip head to unleash Ervin's talkative guitar, while Marvin steadily drives the unit. A tempo shift toward the Bossa Nova ushers in a lyrical head for "Voodoo Village" and expressive, soulful lines that everyone can appreciate. Everette's phrasing is quick and exciting while the tune is warm and danceable. The title track, "East Of The Sun" jumps at us with a delicate guitar statement telling us where we are and introduces us to Gerald's warm and articulate tenor voice. Once again, Everette commands attention with a rollicking ride on the Hammond which drummer Marvin Jones handles formidably. Joining the session for "Didn't We", vocalist Millie Edwards reveals a confident, full-range voice that has, no doubt, been heard in church on many a Sunday. Everette's tasteful accompaniment moves her up tempo with ease until he changes the mood of the tune with an easygoing swing. Millie contributes two other vocals on this date that range in style but not in energy. Her rendering of "What A Difference A Day Makes" is honest and dynamic. She's supported by rhythmic bass lines and James Brown-like comping from Ervin's guitar that knocks me out. Gerald sings through his tenor to tell her that he hears it the same way. In her third vocal, Millie's breathy voice sensually reaches into the lyrics of "Just In Time" and pulls out new things from old, familiar words. Marvin gently rides his cymbal through the up-beat phrases from the guitar and organ and it all works so well. And then there's some Funk for us in "Crisco" which has Marvin shifting styles and Ervin delivering crisp licks-o-plenty. Everette shows how to adapt to the Funk sailing across it like "Crisco" might slide across a hot frying pan: the drums provide that sizzle. The Blues are well represented on this date as well. Two obvious examples are "Lou's Good Dues Blues" and "Blues For Wrinkles". In each case, the fellas are tellin' the truth! Everette changes up on his stops to provide a bigger sound and even switches to the "Erroll Garner" registration for a minute to get to a nicer shade of blue. His left hand works the bass magnificently while Gerald joyfully screams in the upper octave of his horn. Romance can be found in "Lost Love" where a "slapping" bass creates a perfect groove for night dancing. It's hard to sit still for this one as your body moves rhythmically with the groove. When you're seated, go back two tracks for Lee Morgan's "Ceora". Here's a classic Jazz piece interpreted by Everette, Ervin and Gerald in a light swing that is wonderfully accented: guaranteed to please everyone. Gerald's tenor is conversational with lots of things to say. Everette's ability to keep this music swinging is at the heart of this session and East Of The Sun is the right direction for those who agree. Wrinkles DeVan Howls & Barks on "Blues For Wrinkles"
Recorded August 26th, 27th, & Sept. 4th 1996 at Sound Trek Recording Studios. You can catch Everette DeVan at the following Jazz clubs in Kansas City, MO. Web pages created by Gilles Bacon © 1997.